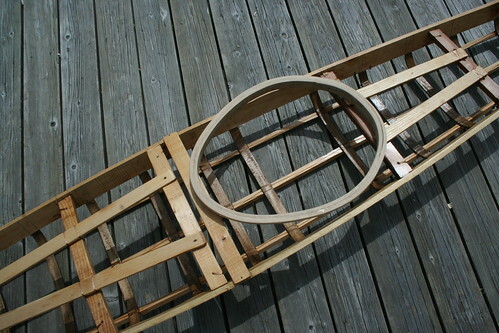 I have been making noises for a while now about building a Greenland style qajaq to fit my daughter Alice. She has paddled my Romany, but that is a big clunky boat on her. SSTIKS is coming up soon, and one of the best ways I have to motivate myself to finish projects like this is to have a deadline. With that in mind, and a chance to put the final coat of polyurethane goop on the skin at Brian’s shop on Friday, under his expert gaze, I set aside this week to devote it almost entirely to building Alice’s qajaq. As of tonight, I have about 50 hours into this project, with another day and a half or so to skin and coat it, and it will be done in plenty of time to go to SSTIKS. I kept thinking I would break this process apart into several blog entries, but each night, when I stumbled into the house at 10:30 or later, ready for a beer and bed, blogging was never what was on my mind at that point. Now, I have the frame finished, and the time set aside to finish the rest, so I can take a little break and post some photos and comments. I did not set out in this case to replicate any particular qajaq. 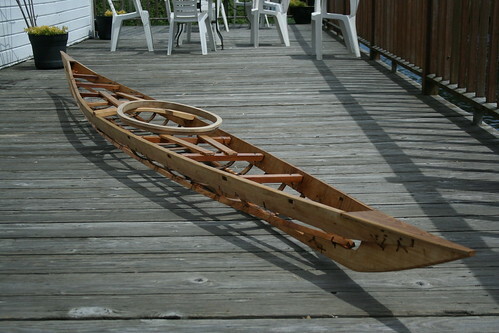 What I wanted was to build a qajaq that would end up about 15 feet long, 18 or 19 inches wide, and snug enough to be a good fit, Greenland style, on a 15 year old girl. I had a stack of books that helped me through this process; I mainly use Robert Morris and HC Peterson’s books for construction technique, and Harvey Golden’s masterpiece, “Kayaks of Greenland” as my guide to design and details. I wanted to make a qajaq that fell generally within “Type V” or “Type VI” parameters, as described by Harvey. I ended up deciding to follow the Type VI description more specifically. What I ended up with, for you qajaq nerds out there, is 14′ 9″ LOA, 19 1/4″ wide at the masik, and 5 3/4″ deep from the top of the keel to the underside of the masik. It should be a good fit on Alice, and might even turn out to be a decent “cheater” rolling boat for someone a little larger. I learned a few important lessons this week, as I always do with projects like this. 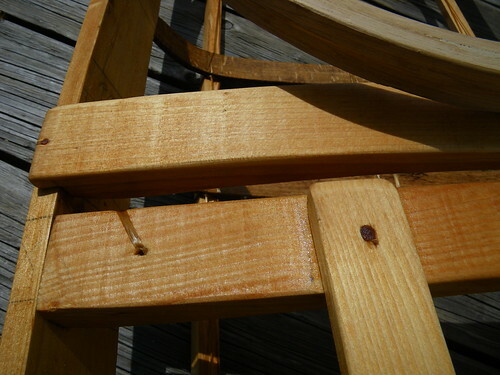 One thing I did not realize when I started this project is that I had sold off all of my perfectly clear, matched sets of gunwale quality lumber. 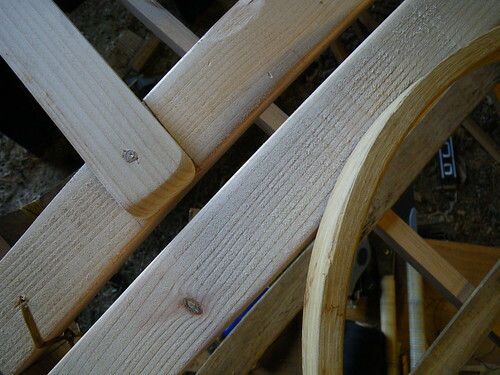 I did a lot of scrounging through the woodshed trying to find a pair of good sticks for the gunwales, and in the end, I came up with one pretty bendy quartersawn piece, and a much stiffer flatsawn piece. I knew that this would be challenging to make a good frame out of, but I didn’t quite realize just how challenging it would be. The first night after I got the lumber picked out and sawn to size, I even left a heavy brake drum hanging off of the stiff piece suspended between two sawhorses, hoping that would help. 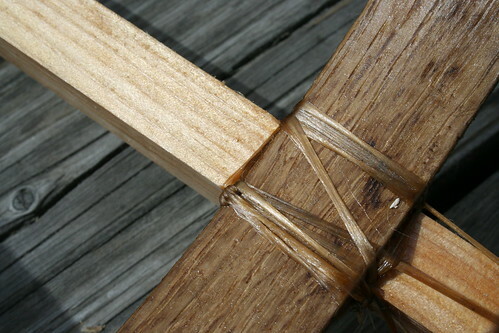 It didn’t do much, and it ended up taking a lot of careful lashing, shims and clamp ties to wrestle these two divergent pieces of wood into a mostly symmetrical frame. 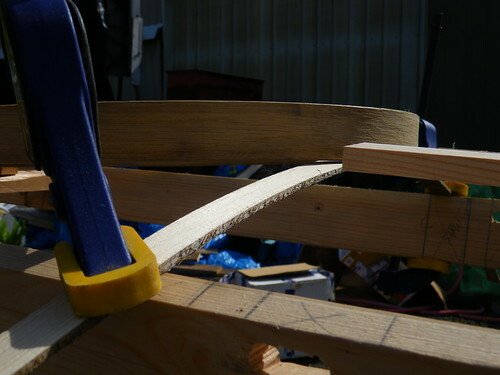 I ended up having troubles with my homemade mortising jig for the router, too, and buggered up a couple of my mortises, which also gave me headaches later. 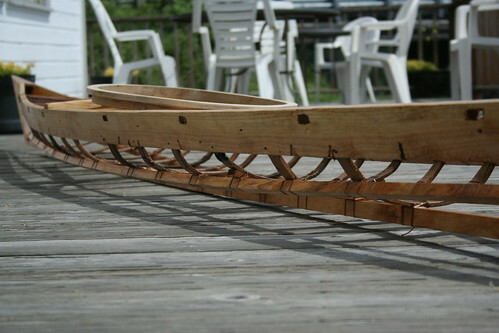 I eventually prevailed, though, and after I got the gunwales and deck beams bent and pinned into their basic shape, it was time to set up the masik, which is the piece that supports the front end of the coaming. In addition to the masik, I added another deck beam, the seeqqortarfiupo. This one supports the aft ends of the forward deck stringers, and provides a snugger fit on the thighs, which seems to make for easier rolling. I used clamps and battens, and a few hours of fiddling around to set up these important deck beams. I hope I got them right! 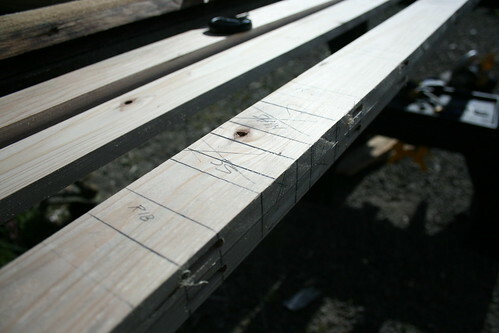 One of the other problems I had was also related to the wood I had on hand, ironically, since I own a sawmill, and have no excuse… but the white oak I had to make bending stock for ribs out of was a little too dry, and had a lot of grain runout that did not make things too easy when it came to bending ribs. My first run at steam bending the ribs resulted in a pile of broken and almost broken pieces. 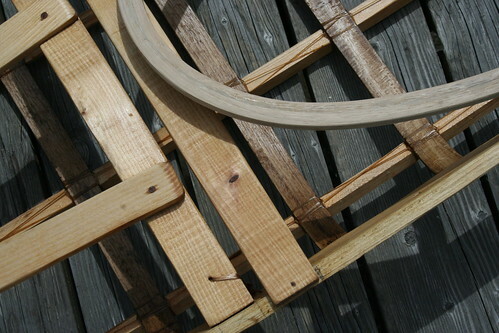 I patched up the better ones with lashings, but the next morning I came out and tried again. The steamer seemed to get hotter that time, and I had much better luck. 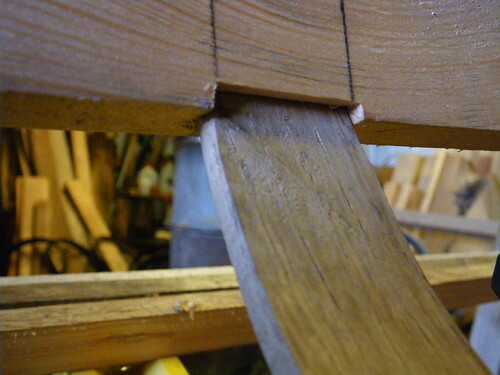 When the qajaq gets exceptionally shallow, it helps the ribs fit easier, with less breakage, if you notch out the inboard side of the mortise. I wish I had done this sooner, and on more of the mortises, but better late than never. I fussed around with the chines quite a bit, too. If I put them too far apart, the boat would have tons of primary stability, but no secondary stability, and would be harder to balance brace and roll. But if I put them too close together, the boat could turn out to be uncomfortably tippy. I also used a string across the chines and keel to make sure that the skin wouldn’t touch any ribs, something I wish I had done on my last kayak project. One of things I love about building kayaks is that you don’t need a ton of space, or a lot of expensive tools. And you don’t need to be talented at furniture grade joinery either. This stuff, plus a drill, router and a couple of small shop power saws and a planer were all that I used. 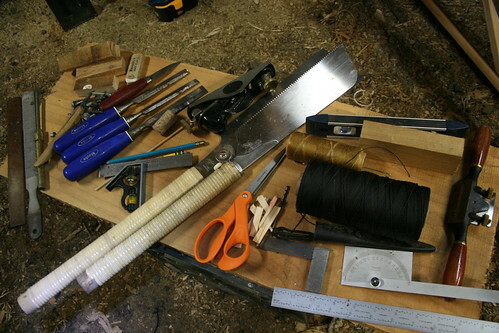 There is no metal in this craft either; the frame is held together with joinery, lashing with artificial sinew and seine twine, and pegs. I finally got the frame nearly finished late last night. I was working away and caught myself brushing mosquitos off my arms with a sharp chisel in the brushing hand, and I realized it was time to quit. When I got in the house, I realized it was a quarter to midnight, and I had been at it since 1 PM. Once I got the frame mostly completed, I oiled it. Nothing brings me the same kind of sensory joy that heating up a nice fragrant batch of “boat sauce” does. 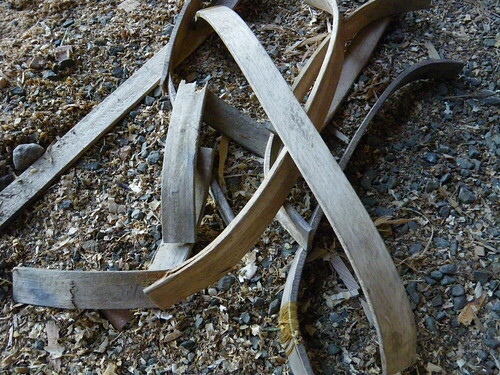 This is made from linseed oil, pine tar (you probably won’t find that at Home Depot! ), turpentine and Japan dryer. I warm it up in a can on the propane burner in the shop and brush it on hot. Hours later I will come back and rub the frame down with a rag, and today I got to set it up in the sun and wind to finish drying. All that remains now is to put the skin on and rig up the deck lines, and it will be ready to paddle. More later, when that part is done! For more photos of the construction process, you can check out my flickr set here.